ABSTRACT: Modeling of protein interactions responsible for cardiac tension development can enhance the understanding of physiological and pathophysiological phenomena of the heart. Principal components of muscular tension development are the proteins actin, myosin, troponin and tropomyosin. The tension is produced by cross-bridge cycling of actin and myosin using adenosine triphosphate as energy source. The cross-bridge cycling is initiated by binding of intracellular calcium to troponin, resulting in configuration changes of tropomyosin. In this work a hybrid model of protein interactions in cardiac tension development is derived on basis of recent measurements and descriptions on protein level. Dependencies on intracellular calcium concentration, sarcomere stretch and stretch velocity as well as cooperativity mechanisms are incorporated. The model quantifies the tension development by states associated to configurations of the involved proteins. The model enables in conjunction with electrophysiological models of cardiac myocytes the reconstruction of electro-mechanical phenomena. Numerical simulations with the hybrid model were performed, which illustrated the reconstruction of steady state and length switches experiments. The steady state experiments describe the force-cytosolic [Ca2+] relationship in intact rat cardiac trabeculae. The length switch experiments provide data on the redevelopment of force after sudden stretch in rabbit right ventricular papillary muscles. Results of the numerical simulations show quantitative agreement with experimental studies. The hybrid model of cardiac tension development offers interfaces to further models of cardiac electro-mechanics. The hybrid model can be coupled with models of cellular electrophysiology and passive mechanics of myocardium allowing the inclusion of mechano-electrical feedback mechanisms. The hybrid model can be applied to elucidate cooperativity mechanisms, pathophysiological changes and metabolism of tension development. State diagram of the model. Two state variables quantify the calcium binding to troponin C (T). Two further state variables describe the configuration of tropomyosin (TM). 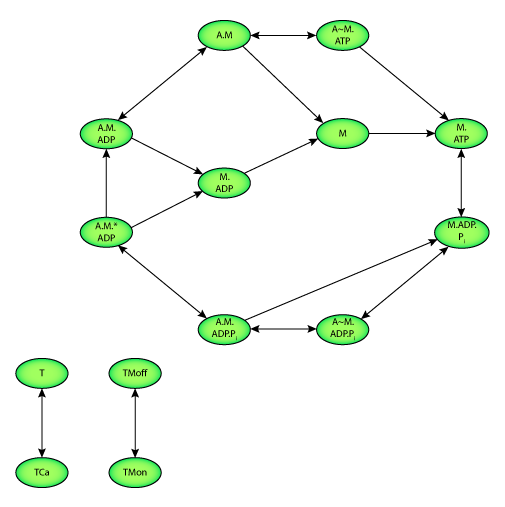 Ten state variables represent the interaction of actin and myosin as well as the hydrolysis of adenosine triphosphate (ATP). M and A represent myosin and actin respectively. Transition between states is depicted by an arrow. The authors suggest that this hybrid model of cardiac tension development provides an interface to other models of cardiac electromechanics. The model can be coupled with models of cellular electrophysiology and passive mechanics of myocardium allowing the incorporation of mechano-electrical feedback mechanisms. Results of simulations with the model can be used to elucidate cooperativity mechanisms, pathophysiological changes, and the metabolism of tension development. Derived from workspace Sachse, Glanzel, Seemann, 2003 at changeset 7215b81f47b9.